Sayenko Kharenko is a leading law firm in Ukraine with an internationally oriented full-service practice. It is currently one of the largest law firms in Kyiv. 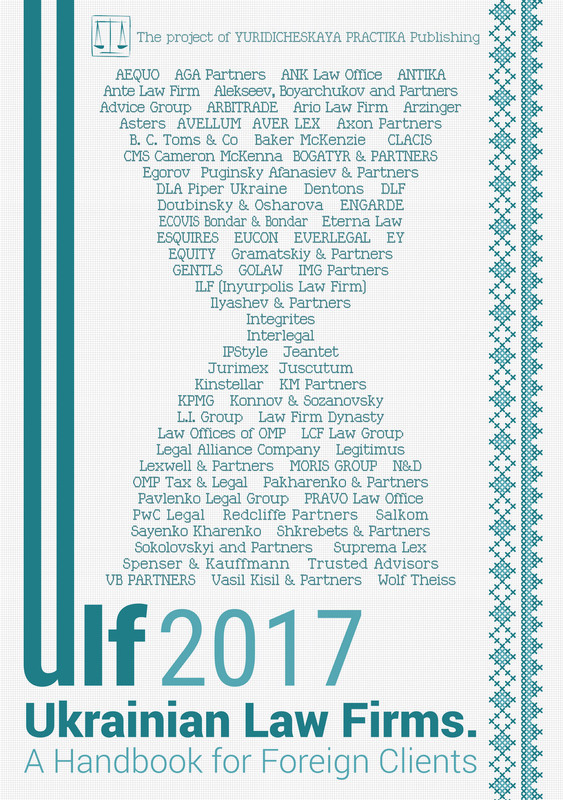 Most recently, Sayenko Kharenko collected three of the most prestigious professional excellence country awards, more specifically, Law Firm of the Year by each of IFLR European Awards 2017, Who’s Who Legal Awards 2017 and Legal Awards 2017. In early 2017, the firm was also shortlisted in Law Firm of the Year category by The Lawyer European Awards 2017 and Chambers Europe Awards 2017. Sayenko Kharenko’s international trade practice group offers a wealth of experience across the full spectrum of cross-border trade regulation and policy to help its clients manage the risks and maximize the opportunities associated with the increasing regulation of international trade in goods and services around the world. Sayenko Kharenko’s stellar team of lawyers is the most expert in Ukraine in the field of international trade and routinely handles cross-border trade and regulatory issues, which require thorough legal knowledge, solid commercial background, and deep trade policy insight. The firm’s team blends all of the above and acts for a diverse roster of foreign and domestic industries. Sayenko Kharenko’s lawyers practice before all the relevant bodies in Ukraine and globally, covering all major international trade law matters, including: international transactions and contractual structuring; agency, distribution and franchising; free trade agreements; trade remedies (anti-dumping, countervailing and safeguards); regulation of foreign trade activity; WTO counselling, WTO dispute settlement, and other matters. Sayenko Kharenko trade lawyers have a great reputation among colleagues and professional community, and come recommended by leading legal directories for trade, customs and franchising in Ukraine. They also serve as Ukraine’s national experts on agency/distribution and franchising at the International Distribution Institute. Sayenko Kharenko is a leading law firm in Ukraine with an internationally oriented full-service practice. It is currently one of the largest law firms in Kyiv. Most recently, Sayenko Kharenko collected three of the most prestigious professional excellence country awards, more specifically, Law Firm of the Year by each of IFLR European Awards 2017, Who’s Who Legal Awards 2017 and Legal Awards 2017. In early 2017, the firm was also shortlisted in Law Firm of the Year category by The Lawyer European Awards 2017 and Chambers Europe Awards 2017. The firm is top-ranked in multiple specialised practice areas according to all international legal directories, including Chambers Global, IFLR1000 and The Legal 500. Sayenko Kharenko has been regularly advising clients on a variety of private wealth management projects over the last few years. Responding to the needs of clients, the firm’s lawyers help to create effective holding structures for operational business, which enable the protection of accrued wealth. Sayenko Kharenko’s team helps clients to determine successful business development models and to create them by developing effective strategies, which include, inter alia, tax advice or optimization, assets protection, risks mitigation and asset management. — supporting fund-raising processes following corporate restructurings, including debt financing, private placement, IPO, etc. Family trusts are currently becoming a more and more popular mechanism to protect and effectively manage the assets of wealthy Ukrainian individuals. A trust is created, inter alia, when a person called the “settlor” transfers property (money, shares, real estate, etc.) to a person known as a “trustee” who owns and manages such property for the benefit of the “beneficiaries”. A trust is often mistakenly referred to as a separate body corporate (like a company) but it is not. A trust is a relationship between a trustee and beneficiaries imposing obligation binding trustee to deal with the trust property for the benefit of the beneficiaries. The trustee is obliged to deal with property in a manner described in the document called the “trust deed” (signed by the trustee and the settlor) or the “declaration of trust” (when the trust is unilaterally proclaimed by the trustee). Trust deed or declaration of trust provides the terms and conditions of management of the trust property by the trustee, distribution of profit to the beneficiaries, etc. In addition to trust deeds and declarations of trust, trusts may also be created through a will. The terms of a trust deed depend on the purpose for which such trust has been created. For example, a trust may be created for charitable purposes. However, one of the main purposes for creating a trust is distribution of benefits (which may include monetary and non-monetary benefits) from exploitation of the trust property to the beneficiaries (e.g. members of the settlor’s family). Family trusts are created to protect family assets by transferring title to such assets to a trustee of a family trust. Transfer of title to several assets to the trustee means that the settlor ceases to be the legal owner of such assets. One of the main purposes for creating a family trust is to ensure that certain assets, for example shares in a family business, real estate, etc., will be safely transferred to beneficiaries (being the children and other relatives of a settlor), on the demise of the settlor. — procure possible optimisation of inheritance and gift taxation. Wealthy businessmen often create family trusts to ensure that their descendants shall benefit from the part of the settlor’s assets transferred into trust. At the same time, such a businessman can utilise the remaining assets without concerns about his family well-being (e.g. invest in risky securities, purchase luxury items or simply spend the money). The terms of a trust deed may provide that the family business, or assets, or specific amount of money shall be transferred to the settlor’s heir only after such person reaches a particular age (typically 18 or 21 years). For example, Princess Diana in her will created a trust for the benefit of her sons. The main part of her estate was left in equal shares to Prince William and Prince Harry, with the shares being held in trust until each prince reaches the age of 25. Afterwards, upon the request of Princess’s mother and sister, the will was amended by the High Court of Justice in a way that both princes were able to obtain their part in the balance of the estate at the moment each of them reaches the age of 30. However, when each prince turned 25, he was given access to all of the income from his trust as well as the power to change the final disposition of his trust if anything remains at the time of his death. The concept of a “trust” typical in the common law system is not recognised in Ukraine. Moreover, Ukraine has not yet ratified the Hague Convention On the Law Applicable to Trusts and on their Recognition of 1 July 1985. In addition to the absence of the concept of “trust” in Ukrainian law, there are a number of other regulatory issues affecting beneficiaries, settlors and trustees of family trusts in Ukraine. Ukrainian currency control regulations are the principle issue affecting family trusts with a Ukrainian dimension in more than one way. Usually Ukrainian settlors transfer into foreign family trusts such assets as shares in foreign companies, real estate abroad and monetary funds held in foreign bank accounts. As a matter of common practice professional trustees usually verify the sources of funds used for acquisition of the assets to be transferred into trust. Furthermore, professional trustees prior to acceptance of the assets into the trust usually require a legal opinion from Ukrainian lawyers that the acquisition and transfer of assets have taken place in compliance with Ukrainian law, which raises additional barriers for Ukrainians willing to create a foreign family trust. Acquisition of shares in a foreign company and/or real estate outside Ukraine requires the Ukrainian resident to acquire an individual foreign investment license from the National Bank of Ukraine (NBU). Moreover, in order to place monetary funds on a foreign bank account a Ukrainian resident needs an individual NBU license to place foreign currency on an account in a bank outside of Ukraine. The next factor affects the use of family trusts by Ukrainian public officials, who are obliged by law while holding their office to transfer the management of their business to other persons in order to avoid any conflict of interest. Transfer of the shares to a family trust may seem to be an option. However, due to the legal gap any further distribution received by such public official or his family members from the trust may be considered as a gift under Ukrainian anti-bribery legislation. The Law of Ukraine On Prevention of Corruption stipulates that the total value of gifts that can be given to an official by one individual or company (group of companies) in the course of a year may not exceed UAH 3,200 (circa USD 114) and the value of a single gift may not exceed UAH 1,600 (circa USD 57). The only exemption is that gifts may without limitation be presented to public officials by close relatives, while distribution from a family trust (not being a close relative) will be subject to the anti-bribery limitations described above. Another issue that seriously affects the use of family trusts by Ukrainian residents, particularly for confidentiality reasons, is the recent development of ultimate beneficial owners’ disclosure regulations. The coming launch of the automatic exchange of tax information in accordance with the Common Reporting Standard (CRS) along with European Union (EU) anti-money laundering initiatives, seek to limit the beneficiaries of foreign trusts in their confidentiality protection. Ukraine has not yet committed itself to participate in the CRS, so technically information on Ukrainian beneficiaries of foreign trusts (at least in the near future) will not be available to the State Fiscal Service of Ukraine. However, it will hardly be possible to maintain that status quo for long. The President and the NBU recently announced upcoming Ukrainian participation in the CRS and several draft laws on its implementation into the Tax Code were prepared in 2016 and may be adopted shortly. (if any), beneficiaries and other individuals, who control the trust in another way. These registers may be publicly available or available only for the authorised bodies at the discretion of each EU member. This requirement strongly affects the possibility for Ukrainian individuals who are not prepared for such a disclosure to use EU-based family trusts. Despite all the factors that negatively affect the use of family trusts by Ukrainian residents for the purposes of wealth management and planning, family trusts will remain an efficient and reliable option for wealthy businessmen when structuring their family assets for years to come.